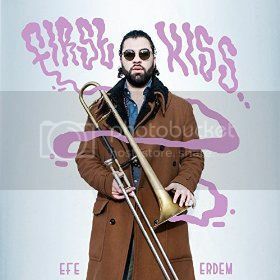 LONG BEACH, Calif., 2016-Jun-27 — /EPR Network/ — The virtuoso trombonist known internationally as Efe Erdem has released his new EP album, “First Kiss.” The album has been proudly published on the RDM Records independent music label without the direction or influence of the corporate music industry. Groovy, jazzy, and full of funk and rhythm ‘n’ blues, “First Kiss” is a startling introduction to this intuitive brass player from Turkey. Efe Erdem cites as main artistic influences James Brown, Maceo Parker, Johnny Guitar Watson, Nils Landgren, Roy Hargrove, and Quincy Jones. His own sound moves on the fringe, blending elements of genres into something all his own, much like the post-bop creativity of Herbie Hancock. His style is off-the-cuff and unpredictable, reminiscent of Trombone Shorty, seemingly inspired at the moment he takes up his instrument. The result is a versatile trombonist with an uncommon flair who can sit in with any crew of players and hold his own, and then proceed to surprise and delight music fans. Playing music which reflects his own unique personality is a key part of Efe Erdem’s performance both onstage and in the studio. It is a principle he wholeheartedly believes in. Schooled in music at Turkey’s renowned Hacettepe Conservatory in Ankara, Erdem has been playing in orchestras and groups since his early teens. By 15 he had already played improvisational jazz in concert halls and theaters. In 2008 he moved to Rotterdam, Netherlands, to continue his studies at Codarts Conservatory as a student of noted alums Bart van Lier and Ilja Reingoud. He graduated in 2012. A much sought-after trombonist, Erdem has performed with Marcus Miller, Benny Golson, Tony Allen, Snarky Puppy members, Roy Hargrove, Bilal, and Robert Glasper among many, many others. He is a member of the Re:Freshed Orchestra, a 16-man orchestra with a rhythm section, horn section and string section. He recently recorded an album with popular singer and composer Frank McComb, and is slated to tour the Netherlands’ own Doe Maar band (The Dutch Beatles) this year. He has performed all over the world, in locales as disparate as Europe, South Africa and Indonesia. “First Kiss” by Efe Erdem is available online worldwide at over 700 digital music stores beginning 26 June 2016. Get in early, brass fans. Very early.